Learn more about our comprehensive visitor resources. 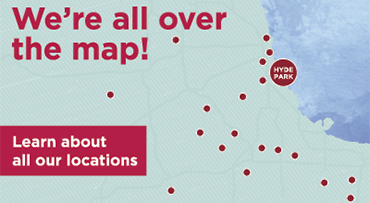 For 24-hour automated phone directions, call 773-702-5580. For general information, call 773-702-1000. 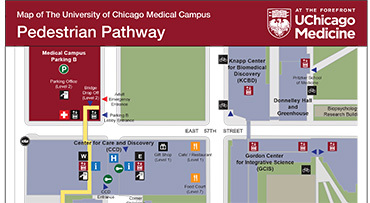 Look for city signs with a blue "H" arrow as you drive toward the University of Chicago Medicine's Hyde Park campus. Due to roadwork in the area, please add at least 20 minutes to your travel time. Take the Kennedy Expressway (I-90) east / Edens Expressway (I-94) east, southbound to the Dan Ryan Expressway (I-90/94) east. Stay in local lanes. Exit at 55th Street, also called Garfield Boulevard (exit 57). Turn left (east) onto Garfield Boulevard and continue onto Morgan Boulevard (Washington Park), follow signs directing you to campus. 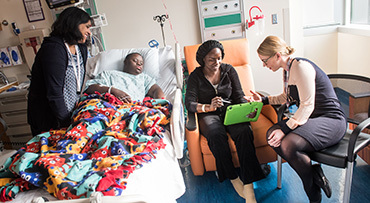 To the University of Chicago Medicine Comer Children's Hospital, 5721 S. Maryland Ave. Follow Morgan Boulevard onto 57th Street. Turn left on 57th Street and drive east for two blocks. Turn right on Drexel Avenue. Turn right on 58th Street. The Comer Children's entry is on the right. Valet parking is encouraged and available at the curbside in front of the Comer Children’s main entrance. To the Duchossois Center for Advanced Medicine (DCAM), 5758 S. Maryland Ave. Turn left onto Cottage Grove Avenue and drive north for one block. Turn right on 59th Street. Turn left on Maryland Avenue. Continue on Maryland past 58th Street. DCAM will be on your left. Valet parking is encouraged and available at the curbside in front of the DCAM main entrance. Travel south on Lake Shore Drive to 57th Street. Exit (right) at 57th Street, just before the Museum of Science and Industry. Proceed on 57th Street headed south, around the museum, following the blue hospital signs. Turn right onto Midway Plaisance, and continue west to Cottage Grove Avenue. Turn right onto Cottage Grove Avenue. Drive north on Cottage Grove Avenue for three short blocks. Turn right on 57th Street and drive east for two blocks. Turn right onto 58th Street. The Comer Children’s entry is to the right. Drive north on Cottage Grove Avenue for one block. Take the Bishop Ford Expressway/I-94 or I-57 northbound to the Dan Ryan Expressway (I-94) west. Stay in the local lanes. Continue north on the Dan Ryan Expressway. Turn right (east) onto Garfield Boulevard and continue onto Morgan Boulevard (Washington Park), following signs directing you to campus. The Comer Children's entry is to the right. From the Skyway, exit at Stony Island Avenue. Follow Stony Island Avenue north, just past 71st Street. Stay to your left to continue onto Stony Island Avenue. Continue to Midway Plaisance, which is just after 60th Street. Turn left (west) onto Midway Plaisance and continue west to Cottage Grove Avenue. The Comer Children's Hospital entry is on the right. Continue onto Maryland past 58th Street. DCAM will be on your left. Take Lake Shore Drive north to 57th Street. Exit left (west) at 57th Street and head south, around the Museum of Science and Industry, following the blue hospital signs. Take the Eisenhower Expressway (I-290) east to the Dan Ryan Expressway (I-90/I-94) east. Continue southbound on the Dan Ryan. Stay in local lanes. Turn left (east) onto Garfield Boulevard and continue onto Morgan Boulevard (Washington Park), following the signs directing you to campus. Take the Stevenson Expressway (I-55) to the Dan Ryan Expressway (I-90/I-94) east. The Comer Children's Hospital entry is to the right. Exit the University of Chicago Medicine campus via 58th Street. From Center for Care and Discovery valet parking, turn right onto 58th Street. From DCAM valet parking, turn right onto 58th Street. From Bernard A. Mitchell Hospital valet parking, turn left onto 58th Street. From the self-park garage, turn left onto Maryland Avenue and left onto 58th Street. Drive west on 58th Street to Cottage Grove Avenue. Turn left onto Cottage Grove Avenue. Turn left onto Midway Plaisance (just after 59th Street), and continue (east) to Stony Island Avenue. Turn right onto Stony Island Avenue, and continue (south) approximately 2.5 miles to the Chicago Skyway (I-90). Turn right onto Cottage Grove Avenue, and continue (north) for one short block. Turn left onto 57th Street. Continue (west) on 57th Street for one short block, and make slight right turn onto Morgan Drive. Continue (west) on Morgan Drive as it curves through Washington Park, to Garfield Boulevard. Turn left onto Garfield Boulevard and continue (west) to the Dan Ryan Expressway (I-90/94). Turn left onto Midway Plaisance (just after 59th Street), and continue (east) until Midway Plaisance dead-ends at Cornell Avenue. Turn left onto Cornell Avenue. Continue east as Cornell Avenue merges into 57th Street, curving around the Museum of Science and Industry and dead-ending at Lake Shore Drive (US-41). Our guide is designed to make your stay as comfortable as possible.